I decided to call it 'snazzeus'. Thank you all for your comments and suggestions. It might even be fun - I'm certainly enjoying the process of designing it. One of the issues is that some (but not all) of the cards are reversible. Obviously this means that the back of the cards need to be rotationally symmetric, to avoid leaking information about the player's hand. While mulling this over, it occurred to me that it would be fun to use an ambigram for the game logo. See wikipedia link for what an ambigram is - but in this case it's essentially a representation of the name which has two-fold rotational symmetry. So, after some investigation, I figured that one option is to create a name using only letters which look like a letter (the same or different) when up-side down. (Some of them need particular gylph styles to work - for example an 'a' and 'e' form a pair only if the 'a' has a curly top stroke.) After trying to do it manually I wrote a script which generates such words, and picked (or modified) some more. I hope for your comments on this list, but welcome any other suggestions. I think undspun is nice, it sounds good to me. I'm dutch and to me it sounds a little like ontspon, which means unravel, of a plot or string. You could say undspun is ancient germanic for as the game unravels. Is there a theme to the game (fantasy, SF, horror, humor)? I would want that before choosing a name, even nonsense words have a flavor. And if you go with capital letters, you add "I", "H" "X" "N" to letters that that are rotationally symmetrical with themselves (along with "S" "Z" and "O"). "M-W" still work in caps. Then there are some cheats where they aren't identical, but can be written that way. "V-A", if you put a dot in place of the bar, and in the V, or simply use a thick point, people will read it correctly. (That's the only one I can come up with, admittedly). If you add in numbers "4-h", "7-L", "8-8" or "8-B", "1-I", "3-E", "6-9-b-d" all work. Not sure that's actually useful. 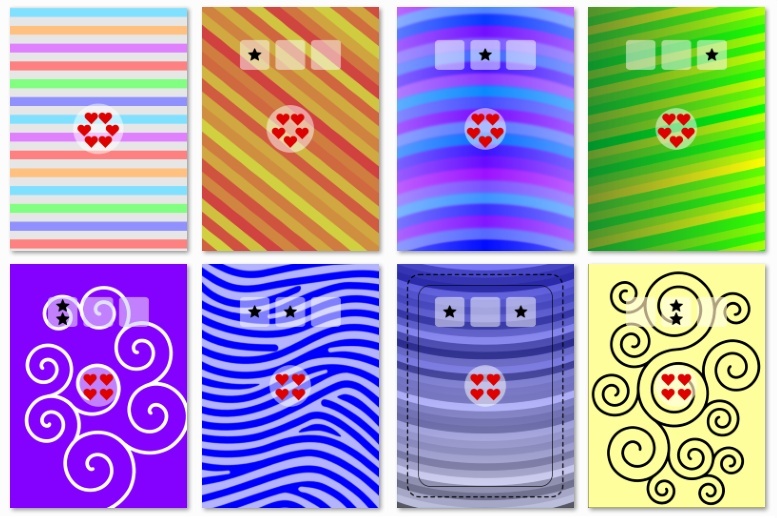 I'm making every card a different abstract design. This is partly because I can't draw, and didn't want to commit the resources to commissioning lots of high-quality artwork at this stage, and partly because I like patterns. I'll put up a link to the few designs I've done so far. They're not finalised, and some definitely need more work - but do feel free to comment on them if you want to. I'm actually taking a slightly odd route to ambigram generation - most people decide what they want to say first. And then do *amazing* things combining different parts of letters, and clever twiddles your brain disregards when upside-down to make it work. I can't do that at all well. There is also an online service which does it automatically, which is fun to play with, although I don't really like the fonts, and I suspect that the extended licence you need for commercial use might be prohibitive. And there's at least one guy doing it by hand as a service for tattoos. I'll add links. I assume that another good characteristic would be if www. *.com was available and the name was not already used in such a way that getting a registered trademark would be an issue. Also, be sure it doesn't look too weird when an upside-down TM or (R) symbol is added at the beginning of the name. Normally you'd just put the symbol at the end, but I assume there's no legal reason not to put one in each orientation to maintain rotational symmetry. I second [MechE]'s request for the theme of the game. Or was that why you shared your card designs? It looks to me like a number based game (various numbers of hearts and stars?) rather than having a specific theme, but with a cheerful hearts and stars kind of feel? I guess "pounod" which sounds like "pow - nod", and looks like "pound", would be more appropriate for a battle game involving large rocks and giants. padunped - the "n" always sounds like an "m" when I say it, but otherwise it rolls off the tongue pretty well and has no Goggle hits (until tomorrow). azooze and snazzeus stand out to me as the best in your list since they are a) relatively easy to pronounce, and b) don't sound completely contrived. If the game is going to be fast you could do a simple name like: dip, nou, boq. If you could incorporate a word that describes an aspect of the game that would be good, e.g. uniun (pronounced union; for a game where you group similar cards). Snazzeus.com - web domain is available, and 'snazzeus' as a username is still open for several online services such as Twitter, Facebook, Gmail, etc. All of which you will want to secure soon if you intend to use the name for promotional purposes. My favorite was dodopop but that one's taken. // azooze and snazzeus stand out to me as the best in your list since they are a) relatively easy to pronounce, and b) don't sound completely contrived. They are also easy to remember, easy to remember how to spell, and unique. "azooze" has been grabbed up for a lot of things already. I think some of you are starting off assuming a larger scale project than I'm working to. I was thinking success could be a basic objective of perhaps 25 backers on Kickstarter. For the actual printing, 100 decks is where it starts to be economic to add a custom pack, so that's sort of a target. Registering IP is not going to happen unless interest is massive. I wasn't even going to do anything on facebook, twitter etc.. But I am persuaded on the domain name thing. dodopop is also a favourite among people I've asked in person. Is the .com domain so essential? It seems to be the only one taken, and that website seems to be giving a server error. Heh. it's a pity wco.com is taken. The quick and dirty code I made to screen names can only accept one alternative for each letter. I translated 'o' as itself. But I've just tweaked it to pair with 'c', and screened some more. The basic gameplay is that the hearts are defence and the stars are attacks. The objective is to play your cards in such a way as to beat the defence on your opponent's cards. It totally could be played with fantasy, SF etc designs, that's even what I originally envisaged. I just don't have the resources to implement that. I'm trying to design the game such that it works for children to play in a playground over playtime. So it's fairly short, can be played with one pack of cards, doesn't require counters to keep track of resources and so on. You should sign up for the accounts and secure the domain name, "just in case". You may not want or see the need for those resources right now, but if your product is successful, you will want and need them then, and if you get them now, you'll have them then. As opposed to somebody else having them, who will see they are available, realize you're going to want them, and secure them in order to squat and offer to resell them to you at a much MUCH higher price. So get them now while they're available and free/cheap, it's no big loss if nothing comes of it, and solves a potential big problem if something does come of it. If you're looking to kickstart, you obviously intend to promote the product at some level, so it could become more popular than you anticipate, and it wouldn't hurt to be ready for it. Plus it shows your kickstarter backers you're prepared. You definitely want " .com" because if you don't have it, someone else does and it causes confusion. (Ask the guy who runs Nissan Computers how that is going.) Dot com is what everyone is expecting you to have. //abbadabbadoo// doesn't work - it would become "oopeqqepeqqe" on rotation. held : did leap ! "Oooh-pecky-pecky" might be a good name for a different sort of game, though. //hey// would be "hay" on rotation. I did it! I bought the domain, I mean. In the end I decided to go for 'snazzeus'; thank you all for your help and advice. So now the domain exists and is attached to my pre-existing hosting, but there's nothing worth looking at there (yet). Most of the delay was due to putting it off, because of the faff with passwords - for some reason my hosting company gives me a different one for every service. And all the instructions are in French, which doesn't help enormously. I'm about three-quarters of the way through designing the card images. Is anyone interested in updates of how this goes? ...or alternatively, anyone particularly want me to kill this thread ASAP? snazzeus sounds snazzy. Dodopop sounds fun. Well done and good luck. Is there a name for this type of thing, when it is also a palindrome as well?